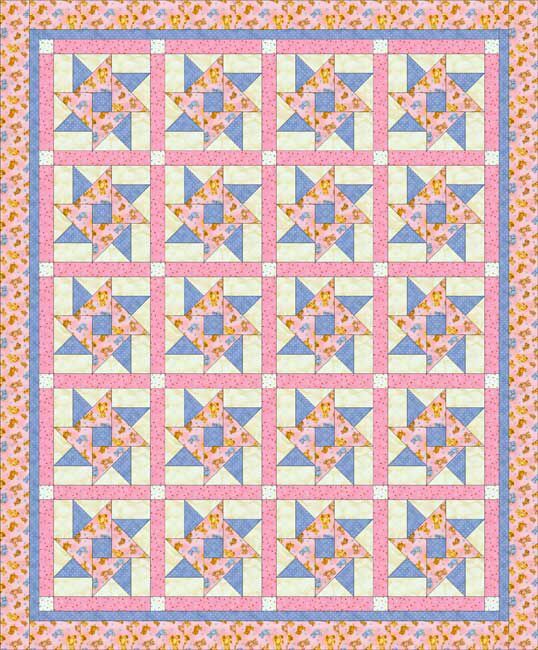 Traditional Double Star quilt blocks (also known as Hope of Hartford) are made from a combination of four identical quarter-square triangle units, one center square, and four rectangles. Double Star Quilt: measures 55" x 67"
Batting: about 65" x 77"
Notice that the Double Star's center is only sewn halfway along each quarter square triangle unit. The squares are not set in, they are sewn to adjacent units using an easy technique called partial seams. Partial seams are the same method used to construct the Bright Hopes quilt block, and we'll refer you there for specific instructions when it's time to assemble Double Stars. We'll quick-piece the quarter square triangle units so that you don't have to deal with small triangles. Quick piecing is helpful, but you will end up with twice as many units as you need because the two units created from each step are mirror images. The additional layout on page 5 shows one way to arrange the extra units to make a small throw that matches your larger quilt. Another option is to use the units to create coordinating throw pillow covers. Sew them together in any layout that suits you. Cutting instructions assume you'll use the sandwich method to make half square triangle parents for block units. Alter cutting instructions if you wish to use another method. Use half square triangle units as "parents" for your quarter squares. Use the easy sandwich method to combine each 5-1/4" blue square with a background square of the same size. When finished, you'll have (80) blue/background half square triangle units that each measure 4-7/8" square. Repeat the process, but sandwich each half square triangle unit with a 4-7/8" pink square. When finished you'll have (160) quarter square triangle units that measure 4-1/2" square, (80) of each type illustrated. Stack the units required for the Double Star together and set their mirror images aside. Sew a 2-1/2" x 4-1/2" background rectangle to the blue side of a quarter square triangle unit as shown. Press seam allowance towards the rectangle unless it is so light that the seam shows through. Repeat to make a total of (80) identical units. Refer to the instructions for the Bright Hopes quilt block. Sew four of the units assembled in Step 1 to the blue center of the block in exactly the same way. Press. The quilt block should measure 10-1/2" square. Make a total of (20) Double Star quilt blocks. Arrange the quilt blocks into five rows, each row with four blocks. Sew a 1-1/2" x 10-1/2" pink sashing strip vertically between each block in a row and at the start and end of each row. Press seam allowances towards the sashing. Assemble (6) horizontal sashing units. Use (5) 1-1/2" white print squares and (4) pink sashing strips for each. Separate sashing strips with white squares, and place a square at the beginning and end of each unit. Press seam allowances towards the sashing. Sew sashing rows horizontally between rows of blocks, matching seams carefully. Sew remaining rows to the top and bottom of the quilt. Press seam allowances towards sashing. Use my straight border instructions to add a narrow blue border (1 and 1/4" strips). Repeat to add a pink border (3 and 1/2" strips). Press. Mark for quilting if necessary. Sandwich and quilt. Sew mitered binding around the edges of the quilt. The illustration shows just one way to use your extra quarter square triangle units. Place the units eight across in ten rows as shown and sew sashing between the rows. Finish with one border at the top and two borders on the sides. Another alternative is to sew the units together into squares or rectangles and make throw pillows that match your quilt. Assemble the extra units in any way that suits you, or save them for another project.